I love the new Quote Stamps from Darkroom Door. 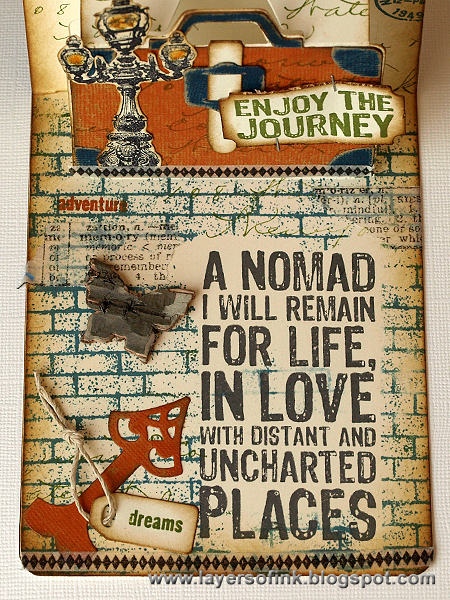 I used the new Creativity Quote Stamp to inspire a cover on an art journal. I started with a journal bought for a few dollars. I created my cover on a piece of white cardstock which I covered in white acrylic paint. I laid a new damask stencil over the surface and used Embossing Paste to add a layer of texture. I then had to wait for that to dry. :) When it finished drying I started mixing in acrylic paint in a lovely shade of lavender fields. I stamped the Darkroom Door Butterfly stamp using black archival ink onto tissue paper multiple times. I repeated the process using the Bold Blossoms I cut the tissue paper and used a sealer glue to apply the butterflies and flowers to the front of the journal. I added the touches of the acrylic orange paint around the edges of the images. I added a touch of white paint after the orange paint dried to soften the edges. I rubbed Soft Plum dye ink over the raised surfaces and touches of white paint to highlight the damask embossing. I attached the cardstock to the front of the journal and added tissue tape around the edges. Hi everyone! 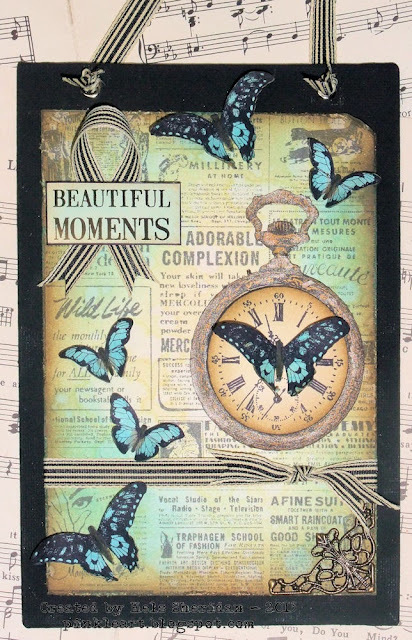 Teresa here :) I was thrilled to see this beautiful butterfly stamp in the latest release. It's really quite a versatile one having open areas for adding colour, yet detailed enough to leave uncoloured as well. Thanks for looking - I hope you're finding the work from the design team as awe-inspiring as I am! Hello everyone! 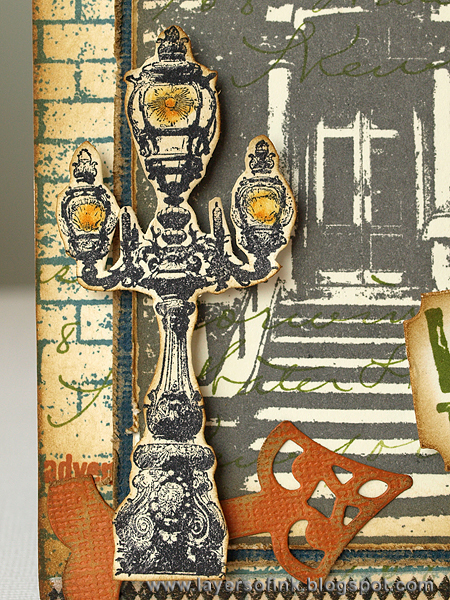 Anna-Karin here with a card using the new Eclectic Lamp Post stamp. I have always liked old lamp posts and this one is gorgeous. Use it to build a little scene or, for example, for Christmas cards. 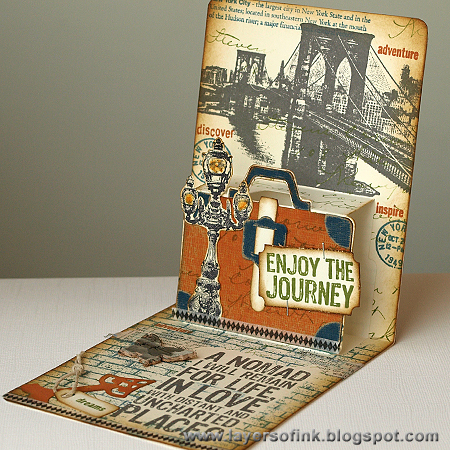 I decided to make a travel pop-up card. This is the inside of the card, stamped with various Darkroom Door stamps. I love the images on the New York Vol. 1 and Vol. 2 sets and thought they fit well together with the lamp post - as does many of the stamps from the other city stamp sets and paper products. 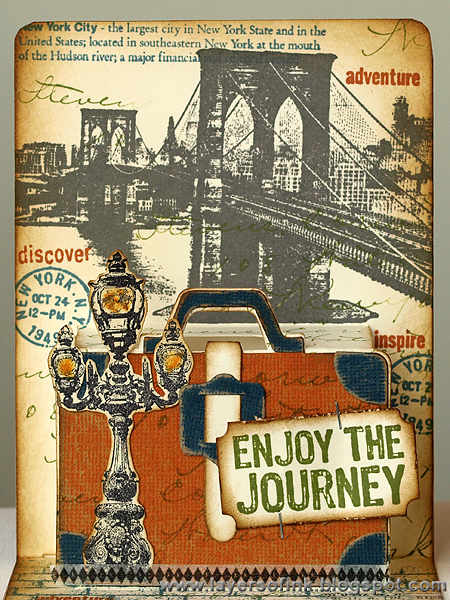 I used the new Wendy Vecchi Archival Inks on this card. This is the front of the card, with a door stamp from New York Vol. 2, stamped with the grey ink. The lamp post is repeated on the front too, as well as many of the stamps used on the inside. I love this Sewing Machine Eclectic stamp! My Mum has a sewing machine just like it. 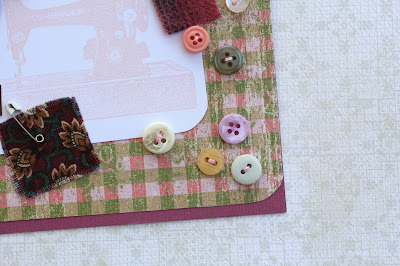 I went full on shabby-chic vintage with this one - pastel pinks and greens, lace, pins. 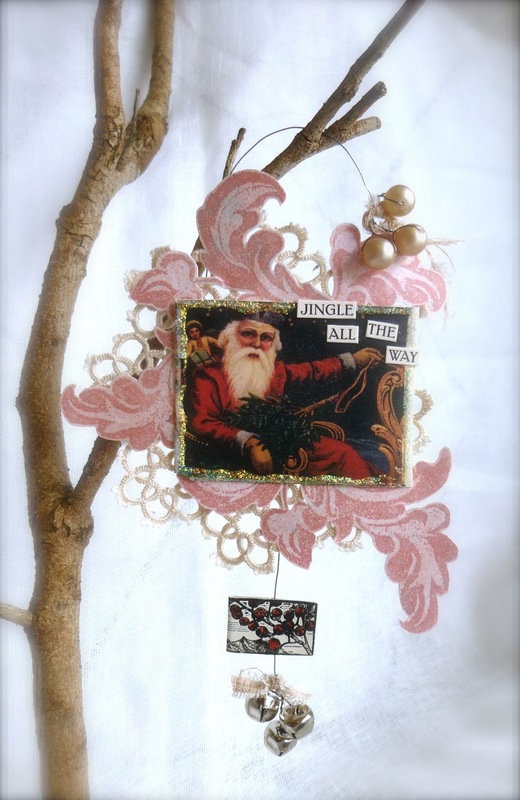 You name it, it found its way onto the card :-) I think half the fun of making a card is rummaging through your supplies, finding the perfect embellishments and special one-off items to complement the design. Or is that just me?! 1. 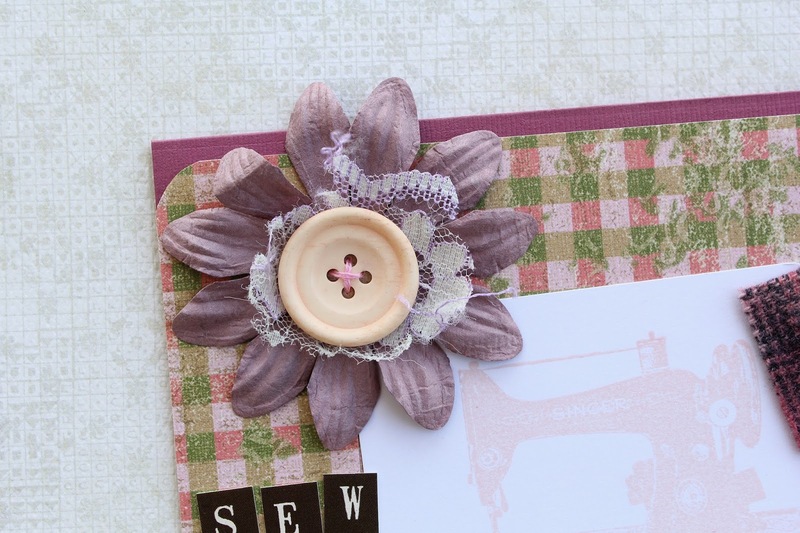 Stamp the Sewing Machine on white card using pink ink. 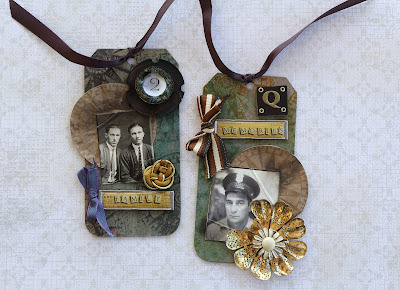 Round the corners and affix to patterned paper. 2. 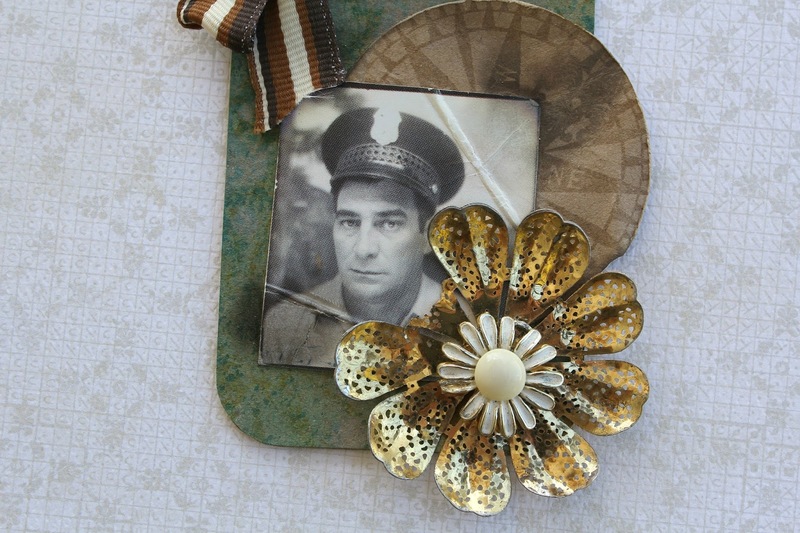 Embellish with scraps of fabric, pins and assorted buttons stitched in place. Adhere to the card front. 3. Attach a small piece of lace and a button to a mulberry flower and stitch it to the card. 4. 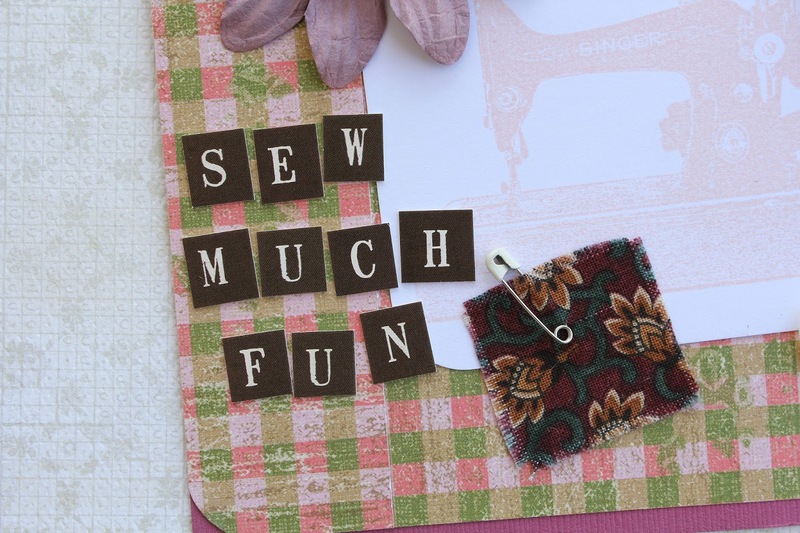 Create the 'sew much fun' sentiment with brown alphastrips. 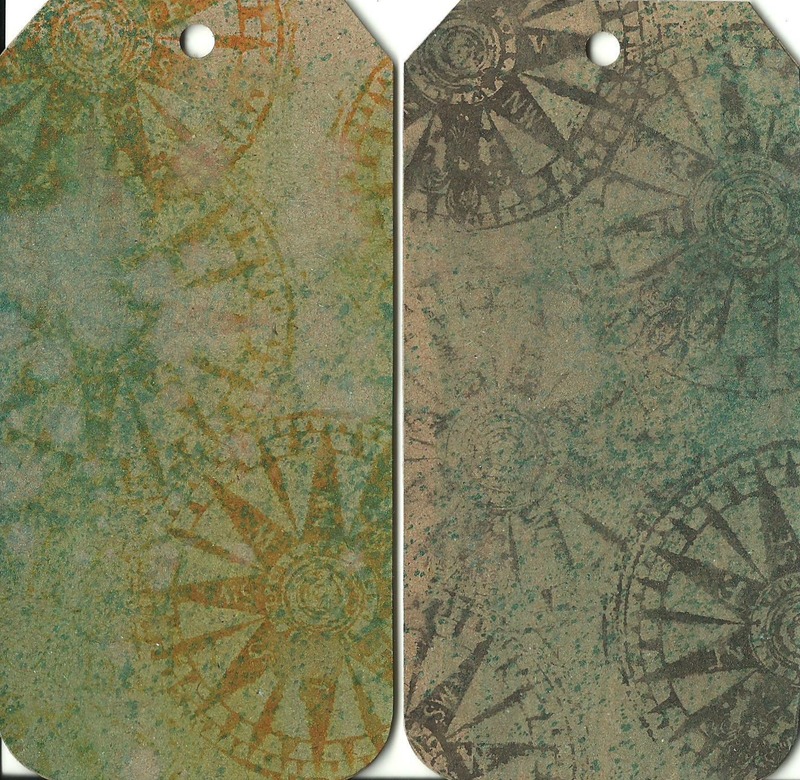 I stamped the compass in the top corner of a Wilderness Photochip, and then matched it up with the same image stamped onto some Prima Lifetime patterned paper. The quote comes from the Wilderness Vol 2 set, and the word 'freedom' is from the Wilderness Wordstrip. 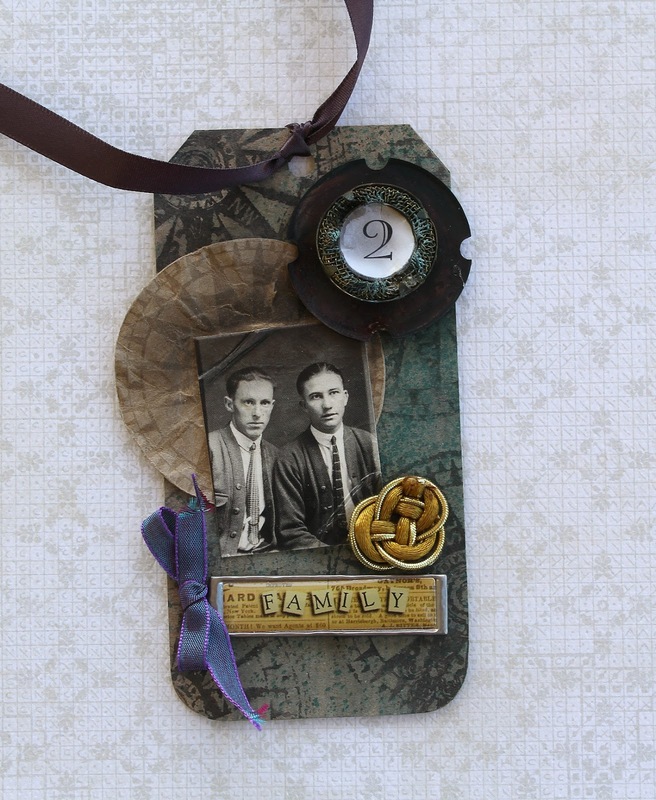 On the base card is the Criss Cross background stamp. 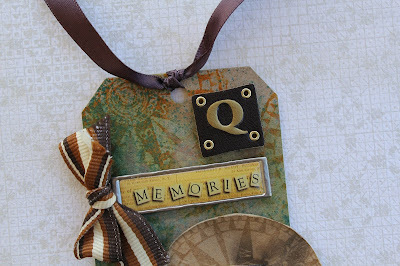 The background was made with Distress Stains onto watercolour paper, and when dry, I stamped using StazOn ink in Saddle Brown. The quote this time comes from the Seaside Vol 2 set. 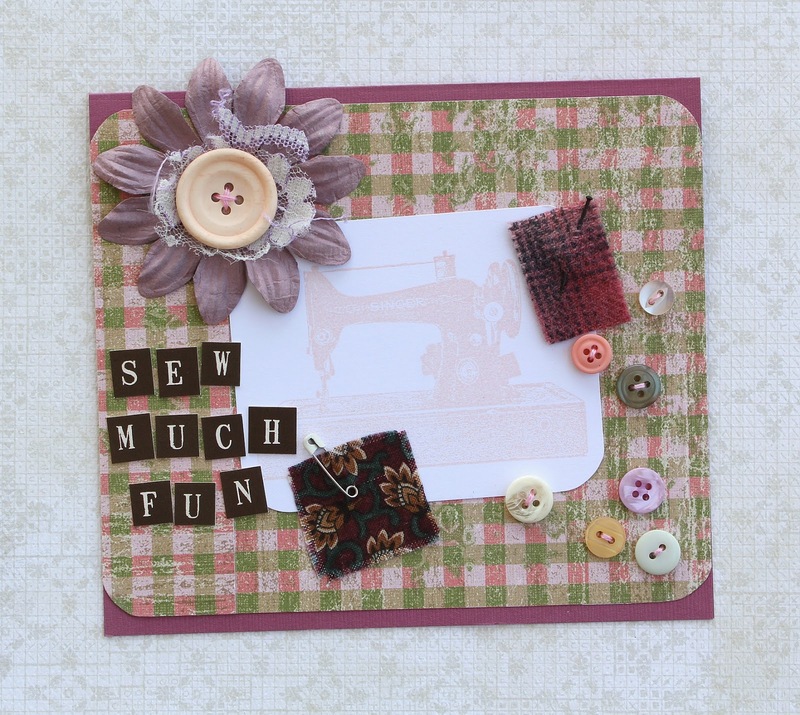 Hi stampers, it's Susie here! I've had the loveliest time creating this romantic gift using one of Darkroom Door's new Eclectic Stamps, 'Pocket Watch'. 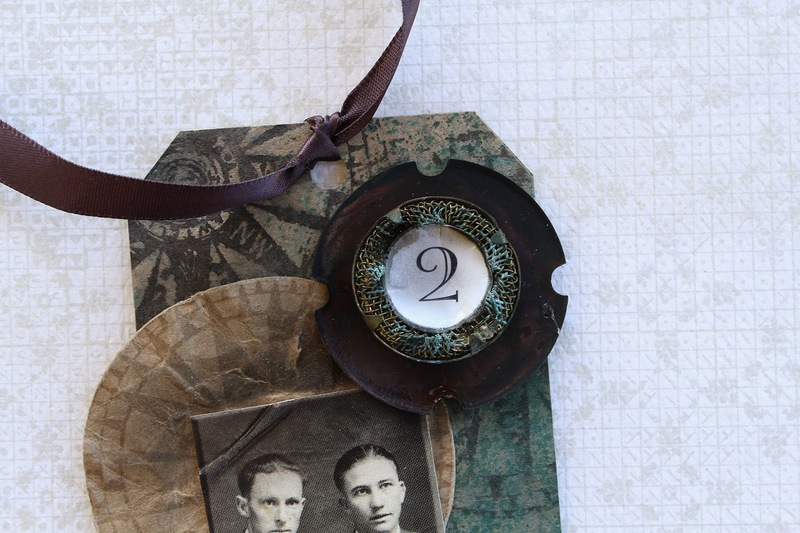 I've created a three dimensional pocket watch that opens to reveal a romantic photograph from Darkroom Door's Love Letters photochips (which could easily be exchanged with a wedding photo of your beloved). Darkroom Door's Ornate Elements stamp set provided the perfect 'etched silver' effect for the outside of the pocket watch. The small glass bottles not only provide the structure to allow the pocket watch to be free standing, but are also wonderful vessels to fill with treasures! The first bottle is filled with gold sand, twigs and embellished with silk fabric, dried flowers and a note from Darkroom Door's Love Letters Vol 2 stamp set. The second bottle is entrusted to hold a love letter (written on the back of a postcard also found in the Love Letters Vol 2 stamp set) and finished with a touch of glitter. 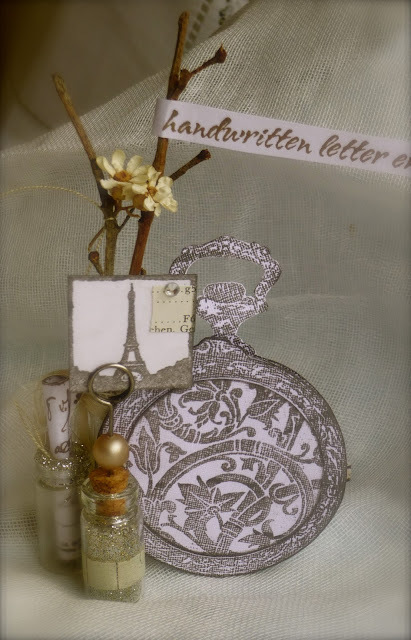 The final bottle is filled with glitter and embellished with washi tape, a pearl bead, pin and an inchie image of the Eiffel Tower from Darkroom Door's Travel Inchies stamp set. Hi stampers - it's Hels here, I also have a project to share using the Pocket Watch stamp! I keep saying this... I do indeedily cos I means it... I am a lucky ducky! Being part of the 2013 Darkroom Door Design Team is such a great honour and I have been so lucky to receive some more of the gorgeous new releases. 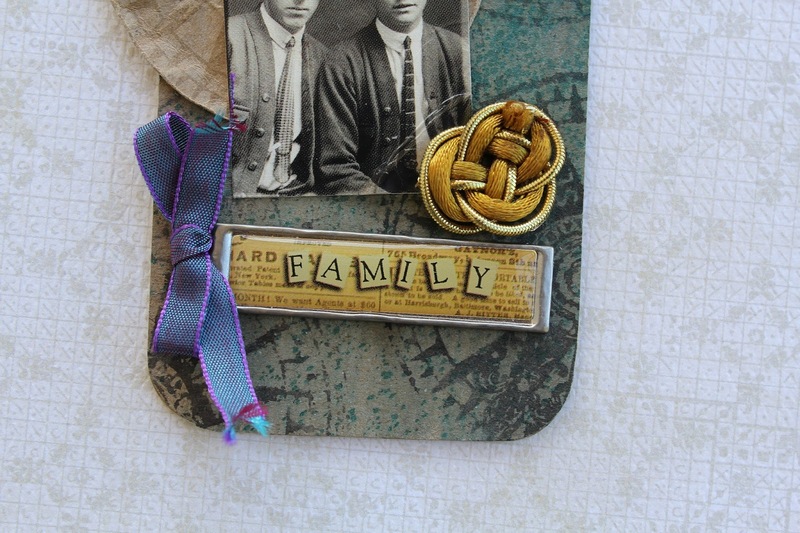 Todays creation is featuring the new Pocket Watch stamp which I am in lurves with. As with all Darkroom Door stamps, you know you are going to get quality rubber and quality images and this beauty of a stamp proves it! The detailing in the design around the edge of the watch is intricate but stamps directly from an inkpad... sometimes really intricate stamps will need ink applying with a brayer, not so in this case (although you could if you were fussed!) However, sometimes I see an intricate design and groan... that usually means lots of fiddle faffing with the cutting out. Not so! You see the top of the watch? I cut that out meself (and I don't do faffy cutting) simply punching a hole in the card and then using the pointy snips of my scissors to go in and cut inside the "handle" of the watch. Colouring the watch was done using a very small amount of Tarnished Brass Distress Stain, applied with a water brush to the edges of the watch and then stamping again, cutting out the middle and colouring with a smidge of Walnut Stain Distress Ink. I then used a paperstump to puff the watchface, applying to the whole image with silicone glue. Simples! The base of my hanging design is a 5" x 7" canvas board painted with black paint. 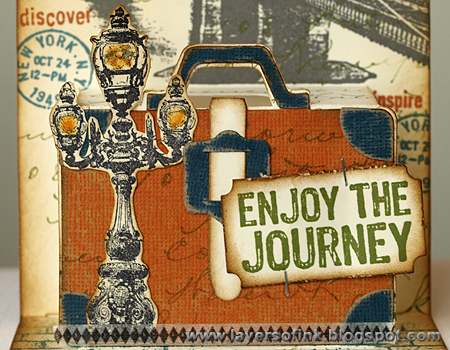 I then used the large Gazette Background Stamp, stamped in Jet Black Archival ink as the base point for the decoration. I used Antique Linen and Tumbled Glass Distress ink to colour the card... spritz and flick with water and dry... then edged with Walnut Stain. Then I decided that the Tumbled Glass was way too pale, so I went back in and added some more just for a pop of colour. 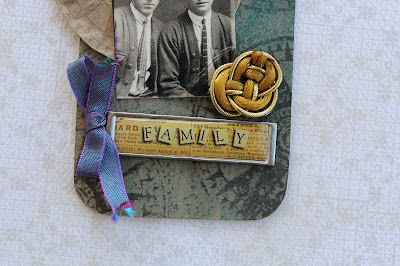 I used an edge distresser to rough up the edges of the card to add a smidge of shabby. The butterflies are from the Wings set (I know, I know... I shouldn't have favourites but... ) and these were coloured with Tumbled Glass DI on the front and Walnut Stain under their wings. The words are from the Art De Fleur Wordstrip (another fave - love that font) and I just dappled Tumbled Glass onto the card to tone it in. Finishing touches were some grosgrain ribbons and a little metal corner. 5 minute Carved Birds card! ..tisn't often that I do speedy makes but the cuteness of the new Carved Birds stamps Vol 2 stamp set from Darkroom Door allows the stamper to do just that... ink and stamp! This literally is a five minute make too. Using a few different coloured ink pads and a couple of the birdies to make a border, simply ink up the birds and stamp them in a line. 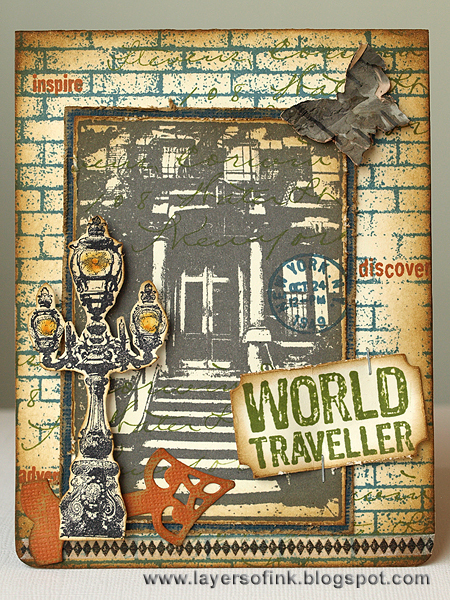 I used the new Wendy Vecchi Signature Designer Archival Inks from Ranger, I do love stamping in Archival to achieve that crisper image but most inks will work well. Once the birds were stamped, I used an Archival Pen and added black to the legs and beaks and eyes of the birds for a spot of contrast. Next I stamped the largest bird in Red Geranium Archival, cut him out and then added Black Archival Pen to his beak and eye and then around his markings. A Sharpie Marker comes is sooo handy for the next step... cut out the bird and then use the Sharpie to draw around the edge of the bird... this will make the red ink have a frame so he pops more from the card. Use a ball tool or paper stump to "puff" his body, add 3d foam, pop him onto the card and then use the Archival Pen to add legs (I added knobbly knees to him too) The sentiment is a fabby Word Strip sentiment... cut out, edged with more Sharpie and then 3D'd onto the card. And done! Sometimes the simplest design and the quickest card can be the most rewarding, I think I have captured the quirkiness of these cute little birdies and using the different colours just adds to the fun. Hi everyone! 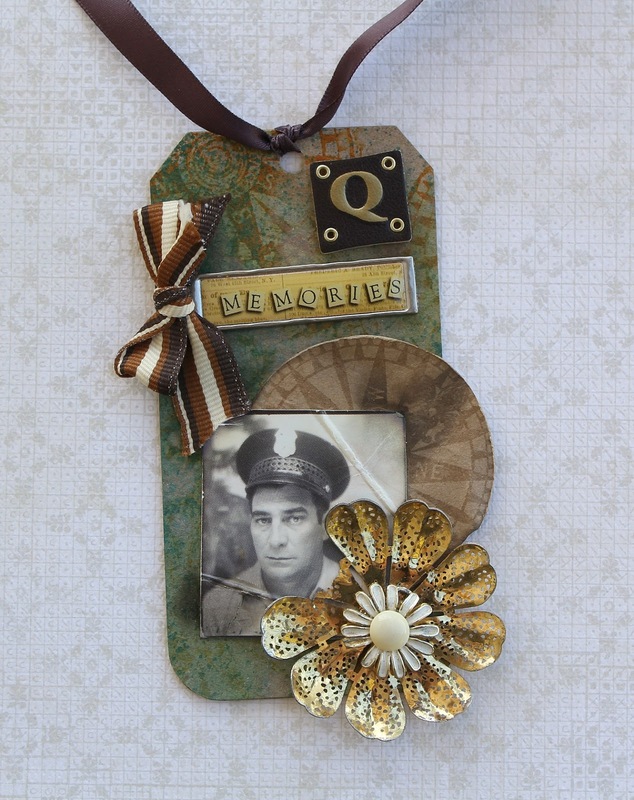 It's Suzz here today with some projects to share! I grew up in the Midwest in America and there was farm land all around us. When I saw the new Country Windmill stamp I was in love. It brought back so many memories of the old buildings and windmills spotted across the fields of crops. I have been seeing some beautiful paintings created using Alcohol Inks. I wanted to create a sky scape using alcohol inks as a background to my windmill. Drip 3 drops of black alcohol ink on felt applicator. Add 2 drops of alcohol blending solution. Smear the black ink along the bottom half of the glossy cardstock. Drip 3 drips of rust alcohol ink on felt applicator. Add 2 drops of alcohol blending solution. Dab over black colored surface of glossy cardstock. Drip 3 drops of yellow alcohol ink on felt applicator. Add 2 drops of alcohol blending solution. Smear yellow over top half of cardstock. 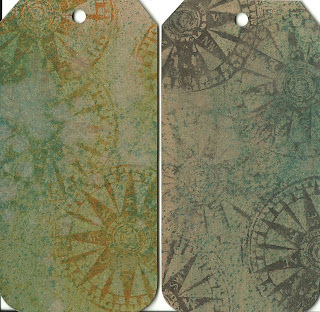 Re-apply alcohol ink as needed to cover top half of glossy cardstock. Drip 3 drops of orange alcohol ink on felt applicator. Add 2 drops of alcohol blending solution. Dab orange ink across yellow surface. Re-apply alcohol ink as needed. Repeat process mixing in caramel, yellow and orange until the background is as desired. Drip 3 drops of black alcohol ink on felt applicator. Add a few drops of alcohol blending solution. Dab over bottom half and along the line between the orange and black. Stamp weeds/flowers using Black StazOn along top of black. 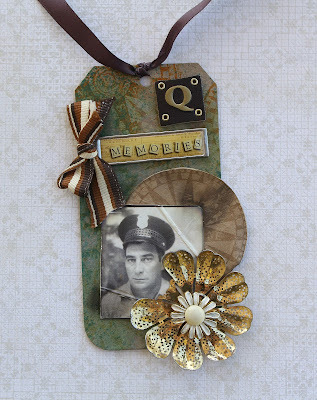 Stamp the Corrugated Iron over the background using StazOn - Timber Brown. Stamp the word Home using StazOn on acetate. Attach with clip on the side. Stamp the sentiment along the left side using StazOn. For my card I used the same background but added a house in the front. I added a house colored with a hint of golden brown to my scene on the card. I also stamped the windmill on acetate using StazOn. I cut out the top and pop dotted to attach. I then added a brad to cover the pop dot.